There are very few movies that I will see in theaters. The trailers have to be extremely interesting to get my attention. Or it has to be a movie that is part of a series that I am already invested in, like Hunger Games. I see even fewer horror movies in theaters simply because they lack the scare factor now days. But I had to see Oculus. One, because it’s about a mirror and I have a weird thing about mirrors. I just know they are the gates to something different whether it is evil or Wonderland. Second, because Karen Gillan was in the movie. As a Doctor Who fan I felt it was my duty to see what Amy Pond has been up to! 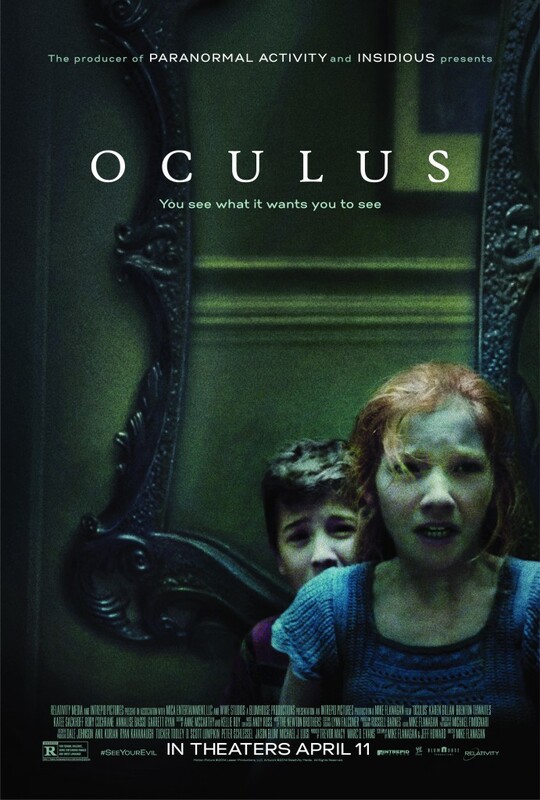 Oculus is about two siblings, Kaylie and her brother Tim, who have lost their parents to a horrible tragedy. Tim was institutionalized, because he was accused of killing his father after he killed their mother, while Kaylie was thrown into foster care. Tim was entered into a psych ward partly because he kept blaming the mirror that hung in his fathers office for his fathers death. While Tim is in the psych ward, Kaylie is passed through the system and is released at 18. Once released she starts to track down the mirror. When Tim turns 21 he is released from the mental institution and his sister decides it’s time to destroy the mirror that destroyed their family and prove her father and brother innocent. Kaylie has found out that her family was not the first to fall victim to this possessed mirror and she plans to get revenge for all who fell to it’s evil. Over all I thought this was an okay movie. It’s not as scary as I thought it might be, but I could see several people getting freaked out after seeing the movie. All the actors did a fantastic job and I am extremely impressed with the kids that played the young Kaylie (Annalise Basso) and Tim (Garrett Ryan). They are so young, but very amazing actors. A few things bothered me about the story. I understand the need for these things to keep the story going, but I am going to complain anyways. Kaylie’s decision to drag her brother into the mess again. Tim had developed this whole story about what actually happened. He took things in his mind and twisted it so things made more sense. Then Kaylie ruins all the progress and creates chaos in his life again. Returning to the scene of the crime WITH the mirror. First, sell the house! It is full of bad memories. Second, why track down the object that created so much heartache? Third, why the heck would you bring the two back together again?? If Kaylie and Tim had an undying need to destroy the mirror they could have done it somewhere else. Did they ever think that maybe the house made the mirror stronger? I understand Kaylie wanting to prove everyone innocent, but if that was my family I would just leave it and try to live a happy life. I know that is what my parents would want for me. The thing I actually enjoyed the most were the eyes of the souls trapped in the mirror…or rather, the images the mirror released. Their eyes were like mirrors. I thought it was rather creative and I have never seen something like that done before. If there is another movie with monsters with mirror eyes, please tell me about it. I did enjoy this movie and I didn’t feel like I wasted my money to go see it. To say I wasted my money because it didn’t scare me would just be wrong. Not a lot of horror movies scare or freak me out any more. The story line was different and fresh. The actors were great. If you feel like going to see a horror movie, go check it out. While I probably won’t buy it when it comes out on video, it was fun to see in theaters. I will be seeing it, of course, because–Amy Pond!